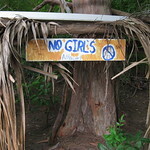 MathRider » Blog » Is Gender Exclusion Still Very Much Alive? There was a time when it was cute—especially when portrayed in films like The Little Rascals—that boys had that “no girls allowed” mentality when it comes to playtime. Not anymore, not in a world where gender equality is close to being the norm. These days, nobody does gender exclusion anymore. Or so we thought. Laura Grande writes in an article for Today’sParent about a story she read that gender exclusion is very much alive, and is still being done not just by children, but also by parents who are supposed to know better. Grande talks about an article she read about parents uninviting a girl from a comic-book themed birthday party for their son because the party was “masculine”, and being a girl, it wouldn’t proper to have her attending. To make up for it, the girl was invited to a separate party just for their son’s female friends. If that isn’t gender exclusion, then I don’t know what is. The idea that a child is excluded from a comic book party for being a girl is downright off-putting, especially when gender equality has become a more widely accepted notion. Do boys have exclusive rights to being comic book fans? Many girls love comic books just as much as the next boy. Obviously, that birthday boy’s parents are still caught up in the mentality that boys and girls will never share the same interests, a very mistaken notion, especially in these days of gender equality. Still, when faced with situations involving gender exclusion, our daughters would tend to feel too self-conscious about it and would have second thoughts about expressing their own interests and dislikes as a result. If anything, we parents must leave all doors open for our children as far as making the things that they like known to people. Deprive them of their own interests because other people would judge them to be gender-inappropriate, and you are in effect depriving them of that sense of creative individuality, and this is something they will potentially carry into adulthood. In all probability, they will pass this gender exclusion mentality off to their own children, and it will just continue as a vicious cycle. This entry was posted on Friday, August 30th, 2013 at 12:47 pm	and is filed under Commentary. You can follow any responses to this entry through the RSS 2.0 feed. You can skip to the end and leave a response. Pinging is currently not allowed.